If you’re amassing American Express Membership Rewards points, it’s because you know how valuable it is to have flexible points that can be transferred to a number of different airlines and hotel chains, or even used to pay down the cost of a trip booked through American Express’ travel portal. If you’ve got Membership Rewards points and you want to book a getaway to Hawaii, look no further than transferring those points to Hawaiian Airlines’ loyalty program: HawaiianMiles. Why Transfer MRs to HawaiianMiles? Depending on where you live, HawaiianMiles is a terrific program to get you to the Hawaiian Islands. Hawaiian Airlines gateways in the United States include Las Vegas, Los Angeles, New York City (JFK), Oakland, Phoenix, Portland (Oregon), Sacramento, San Diego, San Francisco, San Jose and Seattle. The airline also partners with JetBlue and Virgin America. That means you can book codeshare flights from gateways that those airlines serve in order to create one award ticket to get you from home to Hawaii and back. There are some other nice things about the HawaiianMiles program as well. For example, there are no blackout dates when using miles to book award travel. You can also reserve one-way trips and combine different award levels, like an outbound Super Saver flight paired with an inbound Coach Saver or Coach Flex (anytime) award. Mixing award types gives you a lot of flexibility when planning your getaway. Availability of awards is another key feature of the HawaiianMiles program. While it can be difficult to snag award seats to Hawaii on other airlines, it’s relatively easy to find availability on Hawaiian Airlines flights, especially if you book far in advance. Last-minute availability can be decent too if you’re not traveling during peak seasons. 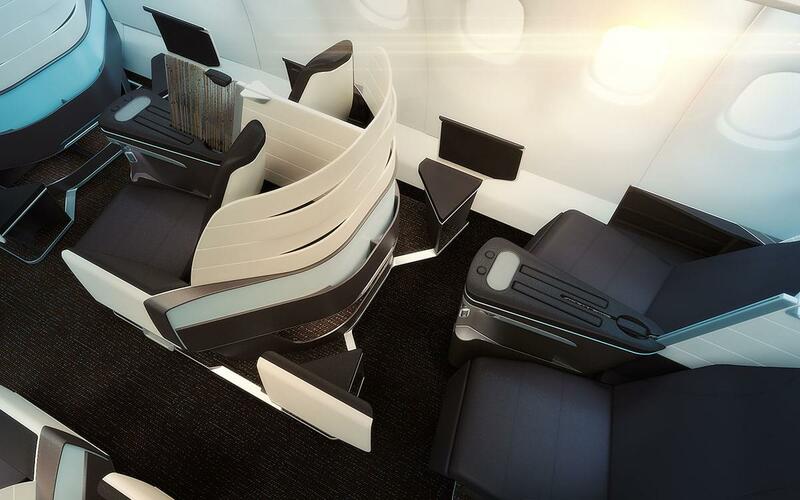 The first class section will include 18 of these lie-flat seats that fold into 180-degree beds that are 20.5 by 76 inches long. The configuration of the seats is in a 2-2-2 pattern. Each seat features power ports, USB connections, and an A/C outlet. A tablet positioned on a telescoping arm powers the entertainment system. What Are the Best Uses for HawaiianMiles? While the Hawaiian Airlines award chart isn’t necessarily the cheapest way to get to Hawaii, it can make a lot of sense if you’re located in one of their gateways, or you can board a feeder flight from JetBlue or Virgin America. And, if you’ve got your heart set on traveling in first class, the Hawaiian Airlines product is one of the best domestic options available. The airline is also a solid bet for flying between the islands. Skip the Flex awards, which are “anytime” awards that are available for double the Super Saver rates. Note that on Hawaiian Airlines you can also fly from Hawaii to the South Pacific, Australia, New Zealand, Japan, South Korea and Beijing, China. Transferring your Membership Rewards points to HawaiianMiles is simple. Just log in to your American Express account and navigate to the Membership Rewards “Travel” area. Click on Transfer Points / Get Started. If you haven’t done so already, you’ll need to link your HawaiianMiles account to your Membership Rewards account. (Click on the “Link Now” text.) Once your accounts are linked, simply click on the Hawaiian Airlines logo and you’ll be able to transfer as few as 1,000 points. The transfer ratio is 1,000 Membership Rewards points to 1,000 HawaiianMiles. Transferring point is free but you will have to pay excise tax whenever you make a transfer to a U.S.-based frequent flyer program. The cost is $0.0006 per point with the maximum fee capped at $99. You can pay the fee in cash or points. So, for example, if you’re interested in booking two first-class award tickets from the continental United States to Hawaii, you’ll need 160,000 HawaiianMiles. You can transfer 160,0000 American Express Membership Rewards points to your HawaiianMiles account and the excise tax will cost you $96. 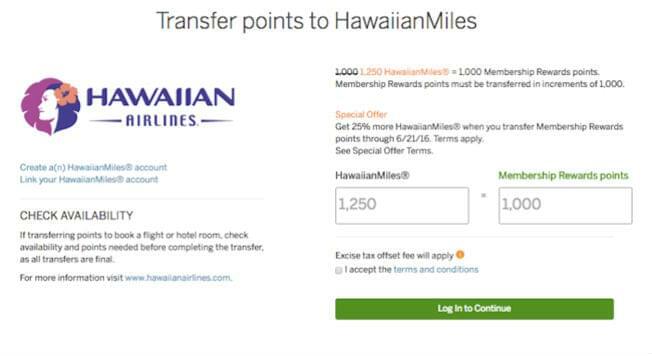 Membership Rewards point transfers to HawaiianMiles are instant. The miles will be in your account immediately upon transfer. If you’ve participated in the Membership Rewards program, you’re probably aware that American Express often offers bonuses to transfer your points to certain frequent flyer programs. While you can’t always count on a promotion, it’s important to watch for them and jump on them if they will help you get to your dream destinations faster and for less points. In June 2016, American Express offered a 25 percent bonus on all Membership Rewards transferred to HawaiianMiles. So, instead of netting 1,000 HawaiianMiles for every 1,000 Membership Rewards points transferred, you’d receive 1,250. This bonus was also available in December 2015. A 20 percent bonus was offered in both June 2014 and June 2013. It’s tough to predict when another points transfer bonus will be offered so always be on the lookout.